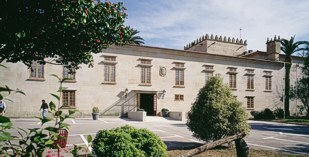 The building is an ancient mansion dating from the 17th century, this Parador offers the tranquillity of the former Pazo de Bazan manor house. Located in the green landscape of the Rias Baixas, the surroundings are made up of luxuriant pine groves, beaches, coves and numerous country houses running along the Galician coast. The Parador is located in the centre of the small town of Cambados, a short distance from the Isla de la Toxa. It has an attractive inner courtyard boasting arcades, a fountain, and a slender palm tree. Pleasant bedrooms with comfortable furniture are delightful in the warm sun. Stone columns, wooden ceilings and beams will be seen in the common rooms. Do not forget the attractive garden and tempting swimming pool. The region of Galicia is famous for its pies and seafood dishes.The Parador's restaurant serves the local cuisine and also has a gluten free menu. Being in the Spanish Rias it is an area noted for shell fish, many of which are cultivated locally. In Cambados, enjoy the pleasant views as you walk down the seaside promenade and around the yachting harbour. Visit the Fefinanes square, the San Benito church, and the Muino da Seca tidal water mill. Outside Cambados, explore the cities of Pontevedra, Vigo, Villagarcia de Arousa, and A Toxa Island. Do not miss the sardine party which takes place during the Santa Margarita Feasts held on July 25th, or the albarino wine party held the first weekend in August. You may also go to the Feasts of San Benito (July 11th), Santa Marina (July 18th), and Nuestra Senora de la Pastora (August 18th). The coast, the rivers and the beaches of Arousa island are excellent for activities such as swimming, horseback riding, 4x4 driving, rafting, cruising and golf. The Parador of Cambados has a seasonal swimming pool and tennis facilities. There is also a nearby golf course. 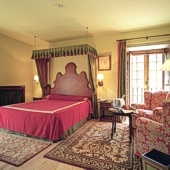 The Cambados Parador has forty four twin bedded rooms, eleven double bedded rooms, one suite and two easy access bedroms. All rooms have telephone, satellite television, safe and a mini bar. There is a restaurant, bar and meeting rooms. 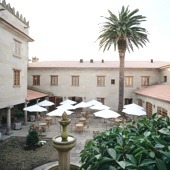 The Parador Cambados also has air conditioning, heating, satellite TV, facilities for the disabled, parking facilities (without security and limited places), free internet access in communal areas, gift shop, currency exchange, lift, tennis court and a garden. Distance from the nearest airport is approximately 70 kms, train station is 11 kms away and the nearest port is 1 km away. We stayed here for four nights in June. The public rooms were spacious and comfortable offering places to meet and chat as well as read quietly. The best feature was the courtyard where you could relax in the sun or shade and be served drinks and snacks from the bar nearby. The staff were lovely and attentive especially in the bar and dining room. Breakfast was a real treat with a great selection of high quality. The pool area was very well maintained and kept spotless and tidy. The tennis court was undergoing a treatment to remove moss but looked like a good facility when clear. Bedrooms were spacious and quiet and bathrooms very well appointed. Everything was lovely and we really enjoyed our stay. Cambados was delightful with a couple of wineries and many intimate bars and restaurants. This is without question a superb location for this impressive parador that was extremely comfortable, with the dining room situated overlooking a shady courtyard. Also, it benefits from a secure car parking and minutes walk to the town. The surrounding area is beautiful and capitivating and I will certainly revisit and stay in the parador again. 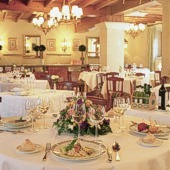 The staff, particularly in the dining room, were charming and attentive. The food was first class. My only criticism is the rather 'glum' receptionist that was unable to smile with her greeting when I arrived and demanded my passport. All the other staff were exceptionally helpful. Our room was fantastic. We did not know from website that it was so near the ocean. Ask for an ocen view. Although the view will be slightly filtered due to trees, it is still marvelous. The room was clean and very spacious. The public rooms are great. They have a computer we could use. We did not feel any warmth from the reception staff. They were in no way rude just not the usual Spanish welcome. We had the best waiter, Diego. He's one special man. The restaurant is beautifully decorated. You feel special when you dine there. The breakfast is to die for. Bigger than most hotels. Always fresh and dishes kept full. We did eat in the restaurant for dinner and it was just OK. Have had better and it is expensive but Diego made up for it!!! It is very conveniently located near old town and you can walk to a number of places. The city's promenade is right in front of the hotel and the walking is fantastic. We would highly recommend this Parador. After completing The Camino de Santiago, for us, there is no better place to really relax and rest than the Parador at Cambados. The location on the coast and in the vineyards is perfect, as everything is within walking distance. But it was the accommodation and facilities that makes this place so perfect. Large welcoming spaces, sunny pool and grassy surrounds to luxuriate in and rest our weary bodies. The people must also get a mention from the reception to the restaurant everybody was welcoming, friendly and ever so helpful. Parador Hotel of Cambados overlooks the Ria de Arousa on the west coast of Galicia.